Riddles in the Dark: Welcome, Precious! Is it reading? Is it? 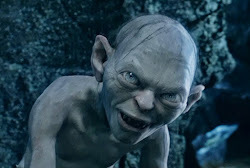 Is it reading our first post, precious? Yes! Heeheehee! It found us! It found our blog! We have a blog now, yes we do. It is all ours! We don't need to steal the short blogger's anymore. Ours is better, much better it is. We are going to try and post two times a week. Yes, two times! It should follow us, oh yes it should! Our blog will have very good posts. Gollum, gollum. So welcome! It will read and leave us comments, won't it precious? It should also go to our "Dear Gollum" page at the top and ask us for advice! We needs questions, precious! We wants to answer them! Congrats Gollum on getting your know blog now! I must think of some questions now. Mmm, we have followers, precious! Smeagol is pleased. Yes, very pleased! We thanks it for following us. Cannot wait for more posts! Oh yes precious, my precious, oh yes! We thanks it for following us!